H-frame reinforced concrete (RC) components extracted from the Clarendon Tower in Christchurch. building was scheduled for deconstruction. are similar in configuration and detailing to specimens previously tested at the University of Canterbury in the early 1990s (Restrepo-Posada 1993). The extracted RC frames where repaired and then setup in a custom designed steel reaction frame to subject them to simulated seismic testing. Testing was completed at Atlas Steels warehouse in East Tamaki, Auckland'. Compusoft Engineering were responsible for the management of wind tunnel tests performed by the University of Auckland on a 1/200 scale model of a proposed regional sports facility. Wind pressures as a result of winds from 36 angles on the roof were measured. Pressure was measured at approximately 256 locations over the upper and lower surface of the roof. The wind tunnel analysis procedure enabled the data recorded to be to processed into a format that could be used in a SAP 2000 software model of the structure. The finite elements used to represent the canopy in SAP 2000 were used as a template to process the data. The SAP elements were then used to determine the normal vector and area of every element. It was then possible to calculate the x, y, and z components of the resultant pressure coefficient of each element multiplied by area. Compusoft Engineering was engaged to undertake the seismic analysis of the temporary stands that were installed at Eden Park, Auckland, to increase capacity for the 2011 Rugby World Cup. During the course of this analysis work it became evident that validation of the strength of the system proposed for construction of these stands was required and that such validation could be achieved only through physical testing. Testing was conducted on specimens consisting of two half members linked by a ringlock and short stub of column. The half members were attached to the ringlock using the wedge connection inherent to the system, while the other (cut) end of the half member was connected to the test machine via a pin inserted in a drilled hole. 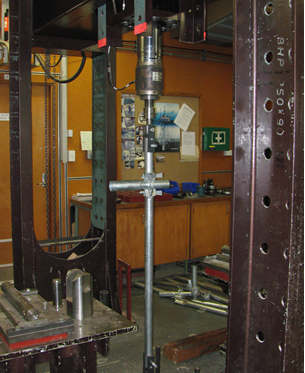 All testing was conducted in the Civil Engineering Materials Laboratory at the University of Auckland. A 500 kN capacity displacement controlled MTS test machine was used to apply forces to the test specimens. Compusoft Engineering was commissioned to organise, supervise, and report testing of three prestressed concrete railway sleepers. Testing followed the procedure outlined in appendix K of AS 1085.14:2003, Railway Track Material – Prestressed Concrete Sleepers. Testing was conducted during April 2012 at the University of Auckland Civil Materials Laboratory using an MTS testing machine with a load capacity of 500 kN.